Cattle, sheep, and pigs are reared for fresh meat. Tenderness and flavor are increased in beef and lamb if hung after slaughter. Meat, having a high protein content, is valuable for the growth and repair of the body and as a source of energy. It is an important source of several vitamins, minerals and other nutrients (e.g. vitamins B, A and D, zinc and iron). Salting: meat can be pickled in brine; this method of preservation may be applied to silverside, brisket and ox tongues. Salting is also used in the production of bacon before the sides of pork are smoked. This also applies to hams. Chilling: this means that meat is kept at a temperature just above freezing point in a controlled atmosphere. Freezing: small carcasses, such as lamb and mutton, can be frozen; their quality is not affected by freezing. They can be kept frozen until required and then thawed out before use. Some beef is frozen, but it is inferior in quality to chilled beef. Canning: large quantities of meat are canned; corned beef is of importance since it has a very high protein content. Pork is used for tinned luncheon meat and in canned hams. Large quantities of beef are prepared as chilled boneless prime cuts, vacuum packed in the film. This process has the following advantages: it extends the storage life of the cuts; the cuts are boned and fully trimmed thus reducing labor costs and storage space. It is essential to store and handle vacuum-packed meat correctly. The storage temperature should be 0-degree Celsius with the cartons the correct way up so that the drips cannot stain the fatty surface. A good circulation of air should be allowed between cartons. When required for use, the vacuum film should be punctured in order to drain away any blood before the film is removed. On opening the film a slight odor is usually discernible, but this should quickly disappear on exposure to the air. 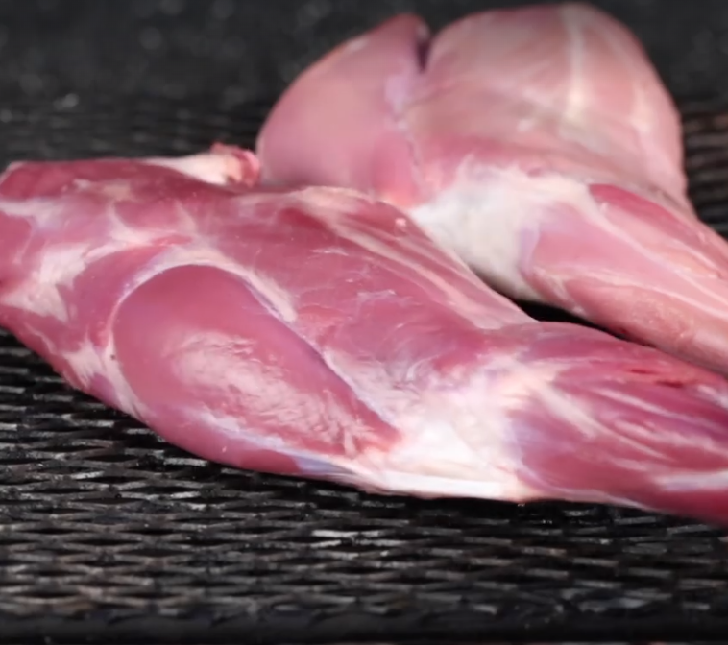 The vacuum-packed beef has a deep-red color, but when the film is broken the color should change to its normal characteristic red within 20-30 minutes. Once the film has been punctured the meat should be used as soon as possible. The flesh of veal should be pale pink and firm, not soft or flabby. Cut surfaces must not be dry, but moist. Bones in young animals should be pinkish white, porous and with a small amount of blood in their structure. The fat should be firm and pinkish white. The kidneys ought to be firm and well covered with fat. Lean flesh of pork is usually pale pink. The fat usually is white, firm, smooth and not excessive. Bones are usually small, fine and pinkish. The quality of the skin or rind depends on the breed. Suckling pigs weigh 5-9 kg dressed and are usually roasted whole.